Home Restaurants What’s next for the King of Pops? What’s next for the King of Pops? 1. Popsicle pick-up window off the Beltline: King of Pops makes its popsicles in a space on Elizabeth Street and Bernina Avenue, right off the Beltline in Inman Park. 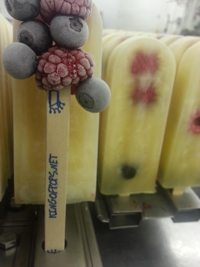 Since it’s easy to keep multiple flavors in stock at that location, and there is usually someone working anyway, Steven says he wants to open a popsicle pick-up window this spring. It wouldn’t have official hours but would be open anytime someone was working—likely weekdays and Saturdays, starting at 9 a.m. He hopes to kick it off with a party on the first Saturday in April. 2. More Queso Kings pop-ups: Although the Carse brothers don’t have any formal culinary training (Steven previous worked at insurance giant AIG and Nick was a lawyer), they enjoy cooking for others and have been talking to Joystick Gamebar about doing a Queso Kings pop-up. Steven says they won’t necessarily stick to quesadillas, but will focus the menu around cheese. 3. Popshop/ casual restaurant: It’s a “pipe dream” for now, but eventually King of Pops wants to open a brick-and-mortar pop shop. Steven says half of the space would be used for popsicle selling, while the other half would be a casual restaurant and bar. He’s partial to Inman Park, Little Five Points, and the Old Fourth Ward, and says that a year from now this could be a serious possibility. 4. Expanded Tree Elves: King of Pops launched the Tree Elves service at the last minute last year, thinking it would be good for the environment and allow them to keep more of their staff on the payroll through the slower winter months. “We sometimes do things by the seat of our pants,” Steven says. “But people were really excited about it, and we sold 250 trees in a week!” Next year, Steven says they will plan a little better with a goal of selling 500 to 1,000 trees. 5. Popsicle trucks: Steven wants to get the two King of Pops trucks out into the city more this spring and summer, taking them to places like softball fields and corporate offices. He says the popsicle carts will be used as destination spots, while the trucks will roam the city. 6. More poptails: King of Pops is expanding its poptail selection, working with a distributor to get these alcohol-infused popsicles into liquor stores. In the past, they’ve only been available at Corner Tavern and for catering orders.